Great to see that Simon Sugar, CEO Amscreen seems to be (very much) carrying on the old UK tradition of Avanti Screenmedia and investing heavily in marketing research and sharing the results. Simon, fresh from some bloke’s stag do we believe, told us (hic), “Amscreen are committed to independent market research to prove the impact of our screens across all our media networks”. Amscreen engage a number of techniques including exit interviews, measurement of sales uplift and utilise state-of-the-art eyeball tracking technology (cue yet-another-unprompted plug for Quividi). The latest research shows that Amscreen’s digital screen media networks present a phenomenal advertising opportunity to brands, delivering high levels of sales uplift, brand awareness and recall. This entry was posted on Tuesday, November 23rd, 2010 at 19:04 @836 and is filed under DailyDOOH Update. You can follow any responses to this entry through the RSS 2.0 feed. You can leave a response, or trackback from your own site. Nice lifts but not nice enough. I would not lead with it for a true ad buy. The issue is that product movement is so low in a single C-store that you would need triple digit lift for these products to defray the ad buy cost. Having worked at P&G I know that they demand a 3 to 1 sales lift for channel spends. There’s a reason for the rule of thumb. And in the DOOH world I’ve been in this situation more times than I care to count. DOOH should keep itself as a pure ad buy if they want the $$ they need today to move the industry forward. 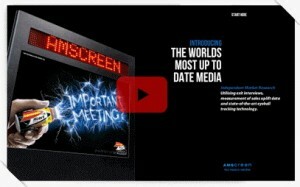 Amscreen should lead with the awareness, recall, brand perception, and INTENT to link to other media alternatives. The best thing about retail DOOH is we’re close the the point of purchase – but it’s also the worst thing when buys are scrutinized on returns. Well there seems very little data on how the screens influence patients in their healthcare GP surgery network. Fact, research shows that close to 90% of what a patient is told by their GP is forgotten within ten minutes of their consultation.So not sure how these screens work on patient recall regarding symptoms disease awareness ,were in most clinical cases there are a number of symptoms, that helps the clinician make an informed diagnosis. The problem also is that the surgery is not a retail outlet so sales uplift would be difficult to measure! and as for measuring patient recall not sure if GPs would be doing cartwheels in the knowledge that thier patients would be interviewed in or around the surgery. Could this be the reason that Amscreens web site is somewhat lacking of information regarding their GP screens. Even clever apprentices get it wrong! !